Celebrating your love? Then Venice, the city of lovers is what you are looking for! The superb, millennia old Italian island set on the Mediterranean sea is a wonder to the eyes and hearts and will be the perfect setting to celebrate your vows ; elope, wed, renew your vows or propose in this magical European spot. Venice is without a doubt the ultimate destination for lovers. Romantic places are plenty as Venice is replete with infinite places, bridges and canals. The Floating city, birthplace of Antonio Vivaldi will seduce you with its amazing architecture and artwork, listed as a World Heritage Site. Amongst them : the best-known St Mark’s basilica and square, the Doge’s Palace and the Bridge of Sigh, the Grand Canal or the Rialto bridge are testimonials of what has made Venice’s reputation of a lover’s city. What could be more romantic that actually being on the water in the City of Water? Because it has such an amorous tint, many couples have chosen to have their elopement or proposal ceremony held right on a gondola, stirring its way up and down the many winding charming canals, surrounded by the city’s majesty. You are sure to get the most romantic and intimate ceremony there, for just the two of you or with your close relatives. But Venice has plenty of enchanting locations to offer, so if you’d rather be on solid ground, the St Pantalon church square or one of the many hidden and intimate places that Venice holds will work wonders for you. Venice holds many perfect option to host this very special day of yours, we just need to select the one that is just for you. 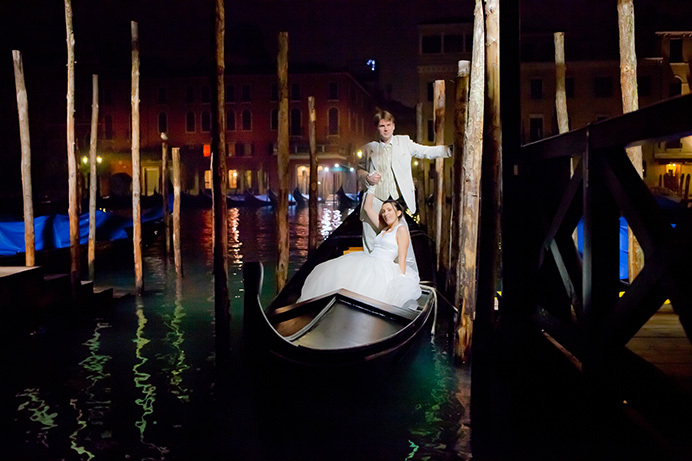 That’s why we are here to answer your questions and advise on what could work best for your Venetian wedding ceremony. At Love Gracefully, we like to design small intimate ceremonies, tailored-made just for you. When celebrating in Venice, we love to work with local professionals to make sure you get the best Italian knowledge we can find there. In 10 years of celebrating, we have selected great local artists that we will be happy to introduce you to. So wether you should need flowers, a hairstylist, a photographer or a videographer, you’ll only get the best for your wedding day in Venise. Our unique wedding officiant in Venice will design the perfect ceremony you have been dreaming of. At Love Gracefully, our celebrant is a real professional who will accompany you throughout the whole adventure to make sure you get exactly what you wish. He will be here to answer the questions you might have about what to where, when is the best time to go, who to celebrate with… He is a decade-long experienced celebrant, and will guide you through the meanders of planning wedding vows overseas. Wether you want a small elopement or an intimate vow renewal ceremony, or if you are looking for a destination wedding or even a surprise proposal, we will design the ceremony to make this day a loving and memorable one. Our experience and expertise of over a decade will be yours ! If you want to know what it felt for couples we already had a ceremony celebrated with us in Venice, please click. We hope to see you soon here in Venice for that special occasion !